Every person has in differing quantities time, possessions and money. These things in and of themselves are not evil. The whole Christian community is one that is to reflect the Holy Trinity. The Church is to be a community where the strongest members support the weakest members. This applies not only to the local church, but also to the universal Church and therefore has a national and international context as well. Too often, even as Christian Disciples we are found turning a blind eye to the suffering of others where the bare necessities of life are in sparse existence. Too often we gather possessions and people, instead of giving up our time and money generously to help the poor and needy of both our world and local communities. Perhaps the greatest indicator of spiritual growth in the Christian Disciple concerns their financial giving. Paul writing to the Corinthians commands that giving be done whole-heartedly and cheerfully (2 Corinthians 9v7). For the Christian Disciple, it is not so much how much is given, but how much is left after giving. God looks beyond the amount that is given to the motive behind the giving. All our money and possessions belong to God anyway, so giving is to be in response to this. Giving is to be done out of love for God. Paul offers in 1 Corinthians 16v2 a three-point system for giving: regularly, methodically and proportionately. Failure to give back to God’s work what He has given the Christian Disciple in the first place, robs God (Malachi 3v8). The reason it robs is because the giving cannot be used to support those who are working for God. As a result of giving, the Christian Disciple will be blessed (Malachi 3v10) and have their needs satisfied (Philippians 4v19). Remember in the Old Testament, Widows were important to God, because justice is important to God. God is a God of justice and mercy. In the Old Testament, under the Law of Moses, God commanded provision for those who were widows, oppressed or uncared for. The Apostles would have known about God caring for the widows and in Jesus teaching about justice for the poor and the oppressed. We know this because if you remember from Acts 2 and 4, people were selling and sharing possessions and ensuring that people within the Christian community were being looked after and cared for. This included making sure that everyone got fed, particularly those who had no family to care for them. And its not just for those in the church – but all in the community where you live. The New Testament church made sure that giving was done and that the poor, the oppressed, the lonely and the widows were taken care of. People working fulltime for the Lord were given recompense by others for their efforts. People gave. How is your giving? How does your church give and care for those in need, in your community? The get out clause as it were these days, is that it would not be good stewardship to give to that person or that cause. After all, they say, “Didnt Jesus say in Matthew 7v6 ;Don’t waste what is holy on people who are unholy. Don’t throw your pearls to pigs! They will trample the pearls, then turn and attack you'”. Of course when they say that they are totally missing both the point and context of what Jesus actually meant. God gave everything so that you and I may life and life in abundance. So by giving, you are reflecting that. This Christmas, give generously, just as God gave and gives generously, and gave His Son as a ransom for sin. Tonight, we delve into the book of 1 Chronicles and this great and perhaps last public prayer of the great King David! It is a fabulous piece of Scripture, I am sure you agree, that tells us a lot about God we as Christians claim to know and love, as well as how we are to respond to Him. Originally 1 & 2 Chronicles were one book. It was the final book of the Jewish Canon, probably written by Ezra and was also known as the “the events of the days”, “the things omitted” which would suggest that Chronicles were to be regarded as additional to the books of Kings and Samuel. It’s a book which was written for those from the nation of Israel who are now in exile, to remind them of their spiritual heritage – the journey & history of Israel as a nation. For us though, not least I, it issues certain challenges to us all. I will be reading from the Authorised Version. It’s the 400th year anniversary this year and as I read, you will see how much of its language has entered into our language today. Its influence on the development of English language is remarkable. Here is the great king David! Now here to Chapter 29, we have King David in his final days before handing over the crown to his son, Solomon. David is no longer the shepherd-boy who slew Goliath. He is at the end of his life. He wanted to build the temple himself, but God told him in 1 Chronicles 28v3 “You are not to build a house for my Name, because you are a warrior and have shed blood.” The building of the Temple was to be ultimately achieved by his great son Solomon to do! So what has happened so far, according to the Chronicler? In the previous verses before our reading, we see how David has given publicly a great deal of wealth including gold, silver and other personal possessions for this building – the great Temple. This was to serve as an active encouragement for others to also give generously! Not only of their material possessions, but also as we read from 1 Chronicles 28v21, their talents and craftsmanship as well! This house of God would be a community effort – King & pauper alike, giving generously and honestly! So here is David, a man, who despite his many faults, is described as a man after God’s own heart. Israel’s greatest king, saying this prayer of intimate praise & adoration to his God in front of the assembled throngs. This prayer, like his gifts of gold etc., could be said, to be David’s legacy to the nation of Israel, to Solomon and by extension also to us. I get a wow factor of God reading this! Look how David talks of God! You can tell that David has had a vibrant and intimate relationship with this God – the God of his youth and his old age. He piles up the metaphors! He speaks of God personally: thou, thee, you, yours, our, I, my. David praises God for who God is! Verse 10 sets the scene “Blessed be thou, LORD God of Israel our father, for ever and ever.” God is their father! He is everlasting! Before Israel was, He is and always will be! He was to be their God and they were to be His people. God takes care of them as a father does His children – giving generously, protecting them and always being available for guidance & wisdom. The whole emphasis is on the LORD God! Greatness, power, glory, victory and majesty – all are yours O God – throughout the earth and the heavens! Yours is the kingdom! Not ours, but yours, O King! For they are attributes of a king! God’s greatness is vast, incomparable and unfathomable. God’s power is that of a warrior: almighty, overwhelming yet alluring; and all power comes from Him to every dependent creature. God’s glory is the exuberant and ecstatic magnificence of His very being! Victory shows God as an all-conquering hero: transcendent and supreme, to whom all creatures and creation are subject. His victories are irrefutable and undeniable. His uncompromising majesty symbolises a dignity, regency, splendour and awesome magnificence! These things: greatness, power, glory, victory and majesty are essential attributes of who God is: indelible, immutable, unchangeable and permanent. God is a King in greater splendour than any of the excesses of King Louis XVI. If you don’t know about Louis, go look him up and the scale of extravagance! This God is a mighty King to be exalted above all things and He is to be held in His rightful place: high and lifted up! As for the kingdom, whose is it? Is it Israel’s? No! Is it David’s? No! It is God’s and His alone! His Kingdom is of total magnificence and greater than the Roman Empire to come! Even greater than the British Empire, which was never to see the sun set on it. Jesus is probably quoting here, in what we call the Lord’s Prayer. So David’s words resonate down through history. In this context however, David uses kingdom to symbolise the fact that the building materials, the amassed wealth, did not belong to Israel, but rather they were God’s alone! God’s kingdom shows His universal influence, authority and universality. Everything is God’s! Its all His! Nobody can say they own ultimate possession of anything! The only reason, to paraphrase David, “we have this amassed wealth to build the Temple is because we have the leasehold to it! God owns the freehold, its all His and because of His generosity we can build Him this house! This is no impersonal statue or idol like the surrounding nations. This is the living God, awesome in all things yet willing to be involved in a personal relationship. This is the God, who through the Levitical Law, wants to live with His people of joy, to be their Living God! This God is the light of all things good, bright and blessed. He is the greatest of the greatest, truly incomprehensible yet also knowable. David is in utter adoration of this great God! I wonder if David knew that this physical Temple itself was only ever going to be a temporary building until the coming of the Messiah – when God would no longer dwell in a house made of gold and stone but rather live in human hearts. It is out of His wonderfully glorious grace that the Lord God Almighty gave the gifts in the first place and the cheerful sacrificial response from His people in gratitude to Him was remarkable! All these things were given willingly – the possessions, the gold, the silver, the skills, the power and strength – all in service of the great God of Israel, the great Father of Abraham, Isaac, Moses and the other patriarchs. That’s the wow factor of God: a God who is abundant in greatness, power, glory, victory and majesty. Its all about God for David! He would say that I am only here because of Him! David has been reflecting on his whole life – from the time he defeated the Philistine armed only with a sling and stone. He sees his past failures, the utter depravity of those but also his repentant heart before a holy God. The end of verse 14 again, “All things come of thee, and of thine own have we given thee“, and this resonates down through history, in churches worldwide as the offering prayer. David exhibits great humility before God, and sets an example for his son, Solomon and the other people of Israel, to follow. David acknowledges that Israel were only tenants in the Promised Land – on a leasehold agreement. They were a nation of sojourners travelling a journey, from their foundation as a nation onwards. It is like David was saying to the Lord: “We are here temporarily but You, O God, are here permanently. What an amazingly generous God you are, giving with such exceeding grace to us.” David confesses they are but transient and aliens in the land God had given them. It is an image tying them to their patriarchs as they wandered in the wilderness, living only on what their God provided them with, as they looked for the Promised Land. It is also an image of an acknowledgement that all life is supremely dependent upon God and God alone. God was to be their God and they were to be His people – to be shining as a light to all nations as God’s representatives. Here is the mighty King David, bowing in humility before a great God whom he adores, serves and worships. He knew that his whole life had been one of dependence upon God for all things, and David was exhibiting this before his people. David’s prayer was that the people of Israel would continue to depend on God but also exhibit that dependence and show how God supplied them graciously. Not only for David but also for the Chronicler too! He was recording this for the people of Israel when they were in exile. The Chronicler reminds the people in exile to be utterly dependent upon God for all and everything. For the Chronicler, the building of the Temple was more a matter of the heart, and built upon the faith of God to supply. This faith was expressed in the building made of gold, silver, wood and other metals. It was due to God’s generosity alone the Temple would be built and nothing to do with David and his people. It would have been a tremendous temptation to be filled with boastful pride about it. It was a test of people’s hearts to see if they really did love their God. Then in the final words of this prayer, we see David praying for unreserved and enthusiastic giving from the people. He changes from acknowledgment to petition. In verses 18-20, David exhorts an outpouring of generosity from his people, from a heart filled with thanks – a heart acknowledging total dependence on God for all things – a heart & life of loyal obedience to Almighty God. Solomon also was to be wholeheartedly obedient and devoted fully to God. A heart filled with peace with God, a life totally devoted to Him, exhibited with joyful giving. That’s what David was praying for his people and for his son Solomon. Its also what the Chronicler was expecting from the people in exile as he recounts this to them. It was to be a community effort of devotion and obedience to an almighty God, on whom they were dependent for all facets of human life. Everybody giving what they could – out of riches or poverty. Firstly, we saw the wow factor of God: a God who exudes greatness, power, glory, victory and majesty. Then we saw David’s utter adoration and dependence upon the God that he knows intimately. So, finally, what does all this have to do with us? 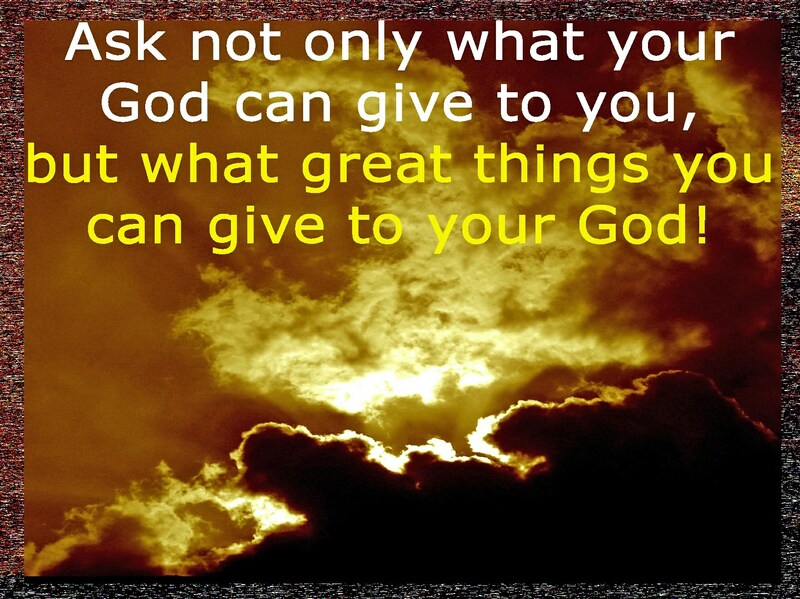 How often do we receive from our God, but not thank Him for it? We are to be thankful for every good gift that is given to us. We offer praises and thanks to Him, for who He is and for His generosity and grace towards us. Tonight’s bible passage was a superb piece of thanksgiving. When was the last time you thanked God for all the things He has given you? How can we put this thanks and praise into action? Lets see quickly! Firstly, I am convinced there are enough wealthy Christians sitting in churches in the West, who could make significant donations and virtually eradicate a lot of the poverty in the developing world and indeed their own countries. This would be active Christian giving on a radical scale. In biblical stories, such as this from 1 Chronicles 29, its always those who had the most, gave the most as an example to others of God’s generosity. After all, God owns it all anyway and it’s only given as a loan from God and not a transference of ownership. As Christians, we are to desire to mature spiritually – growing in adoration, obedience and commitment to God. Perhaps the greatest indicator of today, concerns our giving. Giving is to be done whole-heartedly and cheerfully. It is also not so much about how much is given, but how much is left after giving and the attitude behind it. God looks beyond that which is given to the motive and attitude behind it. All our money and possessions belong to Him anyway, as we have seen, so giving is to be in response to this. Our money and possessions are a leasehold agreement not a freehold one. Giving done willingly is also not done to boost our own egos or for the feel-good factor, but rather to bring glory and honour to God as a thankful response to His giving all things to us. Many prayers seemingly go unanswered because God is waiting on people to be obedient to Him, in order to answer the unanswered prayers of others. .
We are to be generous with everything we have, not just in the area of money but with our very lives. We all have time, information, knowledge imagination, gifts and talents. All these too are to be given back to God . That may well take radical action to do, but radical giving is what we are called to do. God has given everything so that you and I may live and have life, so by caring and giving, we will reflect that. Let’s be radical church together and encourage others to be likewise. But, as we have seen, it’s not only about giving money and resources. Giving is also to include skills, information, imagination and knowledge. Remember, the priests and craftsmen were waiting to give in the building of and service within the Temple. Churches, particularly these days, need to capture the imagination of those looking for a church home, and get them involved. Involvement in such a way that it builds up commitment to God and a growing adoration of Him. If people are involved, they will stay. It means training them up, to be fit for service within the church. If training for service doesn’t occur, then commitment and dedication to God is likely to be diminished. If the same people do the same thing year after year, that local church will eventually die out. Each local church is only one generation away from closing its doors permanently. Giving, as we saw in tonight’s passage, is also a community affair. This Church is to be a community, both within the church and outside of it, where the strongest members support the weakest members. Our leaders here at PBC give demonstrably I think- including their time, possessions, money, knowledge and wisdom. But, as we also saw tonight, it is not just for leaders to give! Giving is to be for everyone! 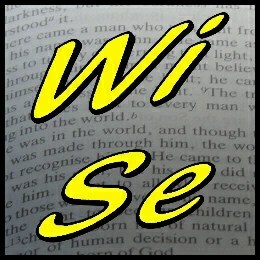 Every church has a fantastic array of knowledge, wisdom, possessions and imagination. Let us share that with people outside the church. Who knows what our caring and giving will do for them as it reflects the glory of God! Too often, we are found turning a blind eye to the suffering of others where the necessities of life are in sparse existence. Too often we neglect to give up our personal space, time, imagination, information and money generously to help the poor and needy in our local, national and global communities. By doing this giving collectively, we will show our faith to be real and practical. There are people out there in our local community just waiting for somebody to give generously to them. We need to be seen to be radically giving to all – of our money, our possessions, and also our time, imagination, knowledge, practical help, care and love. Let us show our relevance to our local community and not be seen as just a curious gathering of people meeting on a Sunday. If you have ideas of how you can help the church here at PBC in anyway, then see the elders or the Pastor and talk to them about it. The New Testament church made sure that giving was done and that the poor, the oppressed, the lonely and the widows were taken care of. People gave. How is your giving? How does your church give and care for those in need, in your community? God gave everything so that you may life and life in abundance, so by giving, you are reflecting that. This Christmas, give generously, just as God gave and gives generously, and gave His Son as a ransom for sin.